There is no need to clean your glasses; the title is correct. Something magic happens when we lose the bonds of rules and become free to explore beyond our habitual boundaries. Sure, we need some conventions in our world to have order and proper communication, but I shink there should also be a time for play and experimentation where some of the rules are suspended, at least temporarily. I am sure there are few English teachers reading this (actually I probably stopped most of them with my title - bye bye now!). When we create a twist on convention, we invent uncomfortable mutations that jar our shinking process. We become like amoebas floating in some new concoction somebody spilled into the Petri dish. God knows what will become of us. Ah, but there is the genius! The creative process is best when we upset the applecart and venture into an unsustainable place to push on the boundaries. The expectation is that we will eventually step back to a world of reality and stop shinking in dimensions that cannot be tolerated in the "real world," (whatever that is) but, and this is a heavy but, we can bring back with us some new vision of the possible. We may be able to morph some of the limiting boundaries. What we need is the freedom to suspend rules and shink about things from an imaginary, unconventional place. One technique I find that really helps is called "Morphological Analysis." The method was invented by Fritz Zwicky in 1967. The idea is to put different concepts on a grid structure with one type of concept on one axis and the other type on the other axis. The easiest way to explain the method is with a simplified example. I will use a basic three by three format to explain the concept. Typically, you would use at least a four by four grid. On the figure below we have the concept of different materials on the vertical axis (water, wood, and sand). 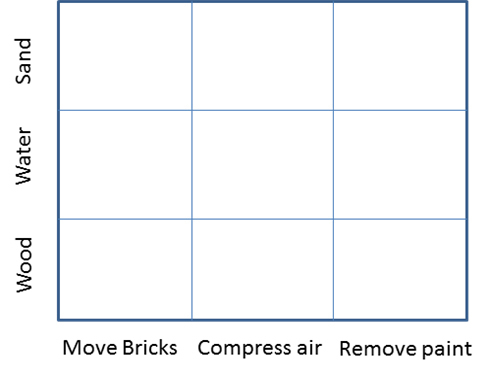 Then, on the horizontal axis, we have a set of actions, (move bricks, compress air, and remove paint). The technique asks us to brainstorm ways we can use water to move bricks, or compress air, or remove paint. Then we do a separate brainstorm of ways to use wood to move bricks or compress air or remove paint, etc. We continue the brainstorm process until we have several ideas in each of the boxes. The shinking process is guided by the intersection of concepts we normally do not combine, and unusual ideas are generated. Zwicky and others have discovered that the best way to get a good idea is to shink up a multitude of ideas (many stupid ones) and then combine or "morph" the shinking into something that has some practical use. It is important to not shink about looking stupid in the process. Just go along for the ride and have some fun creating new ideas that have never been shought of before. You will be amazed at how liberating it can be to allow your magic brain to perform at this level. When you finally come back to reality, the world will look a bit different, and perhaps some helpful idea will be the result. If not, at least you had some fun along the way. For those who say "You cannot allow rules to be broken or you will create chaos," I agree whole heartedly. The creative process relies on a type of chaos where we are not confined by conventional shinking. We can dwell in La-La Land while we envision the possibilities. Wouldn't it be fun to spend a few hours shinking up all the ways we could find to get the US Congress to make decisions? Ouch, that one really does strain the bounds of sanity. Now there is a bunch of world class shinkers!